Physical therapy educator Dr. Patricia King addressed graduates. 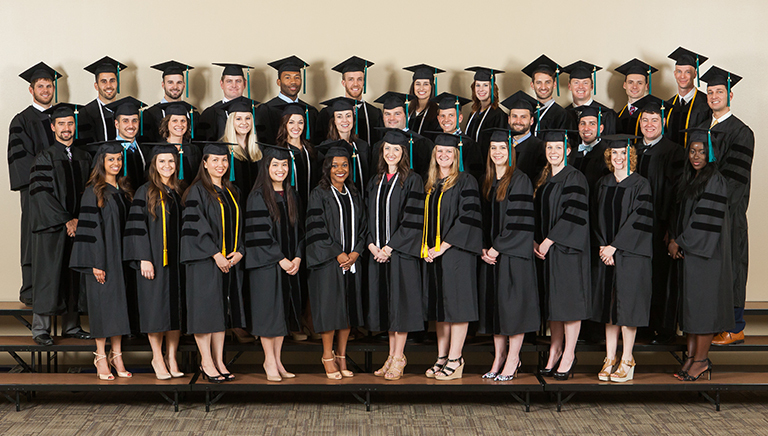 Austin, TX—April 20, 2015—More than 30 Doctor of Physical Therapy graduates from 11 states and Liberia celebrated their commencement from the University of St. Augustine for Health Sciences on April 17. This was the second class to graduate from the southwest Austin campus, which opened in 2012. Dr. Patricia (Trish) M. King, who helped start the Austin campus, was the guest speaker. “This is a significant day for all of us and especially these newly degreed physical therapists who will be embarking upon their professional careers that will enable them to extend to society the very best in physical therapy care,” said Dr. Cindy Mathena, vice president and dean of post-professional studies, who presided over the event. Patricia (Trish) M. King, PT, PhD, OCS, MTC, HFAAOMPT, is professor and chair of the Department of Physical Therapy at East Tennessee State University. She has more than 25 years of experience as a physical therapy educator and has practiced physical therapy in a variety of private and hospital based clinics. Dr. King was part of the founding faculty of the University of St. Augustine on the Florida and Texas campuses. She holds a PhD from the University of Florida in Medical Anthropology and Women’s Studies.